News Clips: HDB and the 99-year lease - How much? In the natural order of things, depreciation sets in as the lease on a property decays over time - meaning as the asset ages, its value should fall in tandem. Housing Board (HDB) flats which are mostly sold on 99-year leases, however, appear to defy this logic - at least for now - supported by healthy home demand and the growing economy. Values of older flats in mature estates remain resilient, with some choice units fetching high prices. A five-room flat in Queen's Road went for $950,000 last year despite having only 57 years left on the lease. That worked out to be $706 psf based on a size of 1,346 sq ft, consultancy OrangeTee said. But prices are unlikely to keep rising through the flat's 99-year lease. The likelihood is that values will fall at a faster clip when the flat's remaining lease is below 35 years. Property agents say buyers may prefer older flats as they are more spacious. Also, some buyers may want to live near their parents in mature estates. Buyers may also bank on their HDB block being picked for the Selective En bloc Redevelopment Scheme (Sers). Under Sers, the HDB acquires ageing blocks for redevelopment. It compensates residents at market rate for their old flats, and lets them buy new units nearby at subsidised rates. "From our engagement with buyers of old leasehold flats, it seems that most (think) they would qualify for Sers well before the end of the 99-year lease," noted Mr Eugene Lim, key executive officer at ERA Realty Network. Such speculative buyers are willing to pay up to a 10 per cent premium over the market price for the old flats, PropNex Realty chief executive Ismail Gafoor said. Such unrealistic mindsets prompted a blog post by National Development Minister Lawrence Wong last month, urging home buyers not to assume that all old flats will be selected for Sers. In fact, only 4 per cent of HDB flats have been identified for Sers since 1995. The vast majority of flats, Mr Wong noted, will be returned to HDB when their leases run out. Observers say Mr Wong's comments are a timely reminder and a reality check for those over-paying for old flats, or buying them in hopes of profiting from Sers. It also creates an opportunity to educate home buyers on issues relating to HDB lease decay as flats continue to age. There are about one million HDB flats. Of these, 70,000 or 7 per cent are more than 40 years into their leases. About 280,000 units are between 30 and 40 years old, according to HDB figures. That works out to about one in three flats being 30 years or older. More than just a roof over the head, public housing and home ownership has been a key pillar of Singapore's nation-building. HDB flats are also seen as a store of value that can be unlocked when needed. They are also regarded as a reasonable hedge against inflation. The issue of decaying HDB leases and addressing the implications on retirement adequacy will pose a challenge for the Government in the decades to come. "It will have to manage expectations that a sizable number of HDB home owners will see the value of their flats being zero at the end of their 99-year lease," said Singapore Management University (SMU) law don Eugene Tan. Mr Christopher Gee, senior research fellow at the Institute of Policy Studies, said: "Retirement security for a majority of Singaporeans is dependent on the housing market cycle, and the presumption that housing prices at least preserve their value over time." Property agency ERA said 1,869 flats with 60 years or below of lease were sold last year, up by about 11 per cent from the 1,679 units transacted in 2015. Deals involving such old units account for less than 10 per cent of total resale HDB transactions last year. Average resale prices of flats with 60 years and under of lease was $364,052 in 2016, relatively stable compared with $364,264 in 2015, said Mr Lim of ERA. Real estate portal SRX Property, meanwhile, said buyers appeared to be "rather agnostic" about the price of flats aged between 25 and 50 years, based on its analysis of HDB resale transactions in at least three estates last year. For example, the median per sq ft price paid for flats in Bedok with lease commencing in 1970 (aged 46 years in 2016) was $407, just slightly lower than $414 for those built in 1995 (aged 21 years). Median transaction prices were much higher for newer flats built after 1995. Dr Tu Yong, associate professor at the National University of Singapore's Department of Real Estate, noted: "Lease decay and depreciation is natural. But other factors like location and demand may push up the value, so the effects of lease decay are not so obvious." Property prices are also dependent on factors such as size of units and their rarity. Rare terraced flats, for instance, accounted for most of the top five HDB deals for older units last year, said OrangeTee. For example, a four-room terraced flat of 1,163 sq ft in Stirling Road, Queenstown, was sold for $980,000 last year, with 51 years of lease left. So HDB flat prices are robust now - but will it be so 10, 20 years later, as more hit 50, then 60 years old? It is hard to ascertain the pace at which flat values will fall. 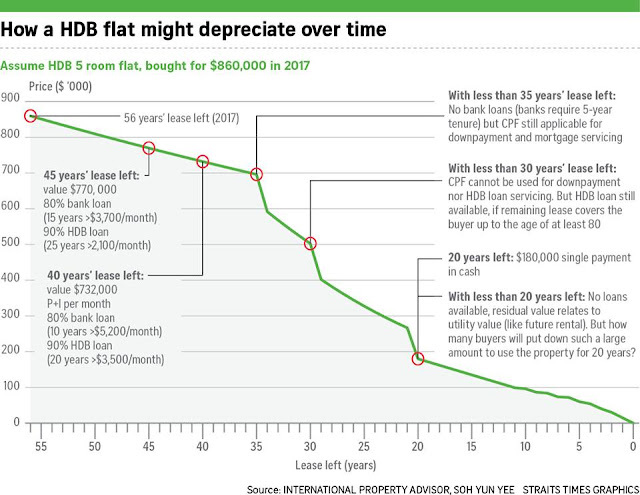 There is no available information on the rate of value depreciation for HDB flats with each passing decade. However, analysts expect property values to drop more sharply towards the tail-end of the lease when loan restrictions and constraints in using Central Provident Fund (CPF) savings to finance the flat kick in. International Property Advisor chief executive Ku Swee Yong said there are possibly three key points in the flat's lease cycle that will mark steeper falls in value as its resale appeal wanes, due to financing restrictions. First, at less than 35 years of lease left when banks are unwilling to extend loans to finance their purchase. That applies to flats that are at least 64 years old. Second, at under 30 years' lease remaining when CPF money cannot be used for down payment or to service the monthly mortgage (flats that are 69 years old). And third, when leases go under 20 years (flats that are 79 years old). "When leases drop to 20 years and below, the prospective buyers will not be able to get HDB loans, bank loans or use CPF for the purchase. Everything has to be paid in cash in one go," Mr Ku noted. The amount of CPF money that can be used to finance the flat purchase is also lower for units with a remaining lease of at least 30 but under 60 years. Even before these key milestones, owners may start to find it difficult to sell their ageing units, Mr Ku said. He offers an example: A buyer pays $860,000 for a 43-year-old five-room flat in a mature estate, with 56 years left on the lease in 2017. Say he wants to sell the flat in 2033, with 40 years of lease left. Assuming the flat is in good physical condition, and its price falls at 1 per cent a year, it would be valued at $732,000 then. If rules don't change, a buyer can only get a bank loan with a 10-year tenure to finance the flat, or an HDB loan with a 20-year tenure. For a bank loan, the monthly mortgage payment will be $5,200 (for an 80 per cent loan over 10 years) and $3,500 for an HDB loan (90 per cent loan over 20 years). "How many households would want, or have the ability, to service that kind of mortgage?" he asked, adding that households can choose newer flats with longer leases, and take loans with longer durations and lower monthly mortgages. This could make re-selling pricey older units challenging. Market watchers are divided on whether Minister Wong's comments on Sers will immediately dent sales prospects for older flats. "For now, because of overall demand, prices of HDB resale flats will not be negatively affected," says PropNex chief Mr Ismail. However, property consultancy Edmund Tie & Company believes it may dampen demand especially for highly priced old units. It noted that there has been more discussion on the lease issue among buyers recently. To be sure, this matter of lease decay is not new. Every flat buyer ought to know that an HDB flat comes with a 99-year lease at best, and the buyer's rights are in accordance with the terms and conditions in the HDB lease agreement. Ms Tang Wei Leng, managing director at Colliers International, Singapore, said: "The HDB owner or lessee has paid a price for the right of use to the property for the lease period. It is therefore fair that the value will run down to zero when the lease expires." Sers is a niche programme affecting 80 sites so far. It rejuvenates ageing estates and gives flat owners a chance to get a new home with a fresh 99-year lease. But it is an expensive undertaking for the Government, which has said it will continue to offer Sers but only very selectively. In fact, SMU's Associate Professor Tan said he won't discount the possibility that Sers might be scrapped in future for fiscal reasons. Barring any new schemes, this means most HDB flats will go back to the state once the lease is up. Flat buyers would best not think of the 99-year lease as a clock that can be reset, but as a guide to planning their home purchase - ensuring the unit meets their budget and needs over the lease period. SINGAPORE - Data shows that buyers don't mind old HDB flats, paying similar prices for units whether they are 25 or 50 years old. But beware a potential sharp fall when flats cross 64, with less than 35 years of lease remaining. That's when financing restrictions kick in. Minister for National Development Lawrence Wong cautioned last month that the vast majority of flats will be returned to HDB when their leases run out. Flat buyers would best not think of the 99-year lease as a clock that can be reset, The Straits Times' Wong Siew Ying wrote in a commentary. 1. HOW MANY OLD FLATS ARE THERE ON THE MARKET? 2. WHAT ARE THE AVERAGE RESALE PRICES FOR THESE FLATS? Average resale prices of flats with 60 years and under of lease was $364,052 in 2016, relatively stable compared with $364,264 in 2015, said Mr Eugene Lim, key executive officer at ERA Realty Network. 3. WOULD PRICES BE AFFECTED BY MINISTER WONG'S COMMENTS? Property consultancy Edmund Tie & Company believes it may dampen demand especially for highly priced old units. It noted that there has been more discussion on the lease issue among buyers recently. "There's more awareness, people are concerned if they put in a lot of money in the flat, whether they can recoup it in the future... We may see prices of the more expensive units easing 3 to 5 per cent this year," said Dr Lee Nai Jia, head of South-east Asia research at Edmund Tie & Company. 4. WOULD PRICES STILL BE ROBUST 10, 20 YEARS LATER, AS MORE FLATS HIT 50, THEN 60 YEARS OLD? Analysts expect property values to drop more sharply towards the tail-end of the lease when loan restrictions and constraints in using Central Provident Fund (CPF) savings to finance the flat kick in. "When leases drop to 20 years and below, the prospective buyers will not be able to get HDB loans, bank loans or use CPF for the purchase. Everything has to be paid in cash in one go," International Property Advisor chief executive Ku Swee Yong noted. From the age of 13, Madam P.C. Koh has lived at her terraced house in Geylang Lorong 3. Now 70, she is facing the prospect of being homeless in less than three years' time. That is when the 60-year lease of her property runs out. Come 2020, it will be returned to the state and its value will plummet to zero. She said in disbelief: "My home is still standing. I don't understand how it can be worth nothing. Will I still have a home to live in?" The short answer is no. In a statement, the Singapore Land Authority (SLA) reiterates the Government's stance: Its general policy is to recover land upon lease expiry. The reality of an expiring lease is slowly seeping in for an estimated 30 households - out of 190 private landed homes - still living in the Geylang Lorong 3 estate. This is especially after National Development Minister Lawrence Wong's recent cautionary note on buying older leasehold properties. Although directed at owners of Housing Board flats, Mr Wong's comment was a stark reminder that all leasehold properties, whether public or private, will eventually go back to the state upon lease expiry. Unlike the case of HDB flats, private property owners can collectively sell adjoining units to another developer before the lease is up. But that ship has sailed for Geylang Lorong 3, given how short its remaining lease is. One resident, Mr Lim Kah Chin, 68, a retired delivery driver, said the estate used to have an association of residents. But its chairman moved out eight years ago when prices were still relatively high. This left the remaining residents - mostly retirees who are not financially savvy - leaderless, he added. "Those who wanted to leave have already sold and moved on. Some died, some went to live with their children, and now it is just the few of us left," said Mr Lim. Like many other residents who spoke to The Sunday Times, he hopes the authorities can find them an alternative housing solution. Housing analyst Nicholas Mak, executive director of SLP International, said they have little choice but to wait for the Government's decision. "The owners will probably not get any compensation for their homes. Any bonus will depend on the goodwill of the Government." The SLA spokesman did not respond to a question about rehousing options, but said: "Each plot of land is assessed carefully, taking into consideration the planning intention and Singapore's socio-economic needs before decisions are taken on the relevant land leases." Mr Mak believes the Government might consider options for the older residents there, as many who have lived there since the estate was built in 1960 are not necessarily well-to-do. The houses were built by the Government as replacement homes when the residents' kampung burned down in a fire. Meanwhile, at Jalan Chempaka Kuning in Bedok, a 70-year leasehold property with 17 years left, residents have been asking the land's trustee to extend the lease at each annual general meeting. Said Mr Akbar Ali, 49: "We don't mind paying a reasonable amount to live here longer because we like this estate." A lease extension would delay the agony that the Geylang Lorong 3 residents are now going through, said Mr Akbar, who is in the publishing business and moved in six years ago. "When the lease eventually runs out, we have to be prepared that the money we spent is gone and that we have somewhere else to live." As for Mr Lim, he now regrets not selling his unit around 10 years ago, when a unit was sold for around $200,000. He paid $35,000 for the two-storey terraced house in 1987. "I stayed on as I needed a roof over my head. This place was also where I met my wife, so I couldn't bear to move," he said. Whatever sentimental reason he had for staying faded with the expiring lease. Neighbours who moved out were replaced by temple operators and foreign worker quarters, and the once-lively neighbourhood has lost its vibe. A rat problem has forced residents to build knee-high partitions at doorways to keep out the pests. "We will be lucky if there is any buyer at all, with only three years of lease remaining," said Mr Lim. Having grown up in the good ol' 1980s, I feel pangs of nostalgia now and then, gazing in wonderment at how much skylines and neighbourhoods here have changed: Old and once-familiar landmarks making way for gleaming skyscrapers or some other modern-day infrastructure. At these times, as if on cue, rosy memories of youthful bliss would bubble up. One of the best ones was of the sun-drenched five foot way outside my grandfather's barber shop, in a quaint Jalan Besar shophouse, where my cousins and I played any number of childhood games in the sultry afternoon heat. Skip 30 years ahead to 2013. It was with this sense of nostalgia - a hope of recreating that warm and fuzzy feeling - that I took up the search for an HDB resale flat to call my own. "How nice to live in a little charming estate steeped in heritage," I thought. Predictably, I found myself looking at the old walk-ups in Tiong Bahru and chanced upon a three-room flat on the ground floor of a block in Lim Liak Street. The unit was then 40 years into its 99-year lease. It was old, a fact that was immediately apparent once I stepped into the 800 sq ft-plus space. The walls could use a fresh coat of paint and the bathroom felt slightly depressing. It was in its "original condition", the property agent had said. As the flat ages, its value would decline accordingly. Theoretically, the value of an HDB flat at the end of the lease is zero. A sobering thought, given that the flat is for most people their largest store of asset value. While the state of the unit did not put me off, the asking price and the extensive renovation the flat needed did. I was also concerned about the ticking 99-year-leasehold clock. It had 59 years of lease left at that point. Surely, the value of the unit would depreciate as it gets older? Who would buy it if I tried to sell it 15 years down the track? "There's the hope of Sers (the Selective En bloc Redevelopment Scheme) in the future," I mused. In that scenario, HDB would acquire the flat - which would be demolished - at the prevailing market value, and offer a replacement flat in a new block at a subsidised rate, with a fresh 99-year lease. Compelling. But Sers is never a given, and it is risky to bet on it. In the end, pragmatism ruled the day and I went for a much newer, 11-year-old flat in a highrise block nearby and, in so doing, bought myself more time. The HDB said that Sers is offered on a "highly selective basis" to residents of public housing blocks located in sites with "high redevelopment potential, subject to the availability of suitable replacement sites and the Government's financial resources". So what happens when the lease runs out? "The flats will be returned to HDB, who will in turn have to surrender the land to the state," National Development Minister Lawrence Wong said in a recent blog post, reminding home buyers not to assume that all old HDB flats will automatically be selected for Sers. The thought that HDB flats would lose their value significantly is perhaps not front and centre of the collective consciousness, owing to several reasons. Second, many Singaporeans do not think the Government will let the 99-year-lease time bomb explode. They believe the Government will intervene to help support the value of their flats - as it has done for years - by improving them through estate-upgrading programmes or redeveloping them under Sers or some other new policy down the road. Third, there is no precedent. No public housing block has hit that 99-year mark yet. Today, there are about one million flats in Singapore, with just 7 per cent, or about 70,000, more than 40 years into their leases, according to HDB figures. Depreciation aside, once the lease declines below 60 years, there are constraints on using Central Provident Fund (CPF) savings to finance the property, noted consultancy OrangeTee. The owner would not be able to use his CPF Ordinary Account savings to finance the unit if the flat has a remaining lease of less than 30 years. For flats with a remaining lease of less than 60 but at least 30 years, the sum of the owner's age and the flat's lease balance must be at least 80 years for the owner to be able to use CPF savings for the property. However, the amount of CPF savings that can be used is lower for such flats. Owners of very old flats would similarly face difficulties in re-selling their unit later on, as the pool of buyers starts to shrink due to CPF and loan restrictions. The HDB housing loan will not be extended to flats with less than 20 years' lease, while banks typically do not provide financing for units with under 30 years of lease balance. These restrictions mean the old flats can be sold only to buyers who are "cash-rich", noted International Property Advisor key executive officer Ku Swee Yong. To this end, paying top dollar for a flat of 40-plus years today, and hoping to make a hefty profit from its resale 20 years later or for it to be picked for Sers is not realistic. Of course, the lease is but one factor that will affect a property's value. Others include market supply and demand dynamics, as well as the location's attributes. Ultimately, the decision to buy a home is a very personal one, depending on individual needs, circumstances and finances. The purchase is, for most of us, a big long-term financial commitment, and due diligence ought to be done. Last year, Ms Siah Yuet Whey bought a Housing Board flat that is older than she is. She is 28 years old. It is 44. This means that she will most likely outlive its lease - which runs out in 55 years. She will be 83 then. That did not stop her and her husband, 31, from paying more than $700,000 for the three-room unit in Jalan Ma'mor, in Whampoa. At 861 sq ft, it works out to $854 per sq ft - the third-highest amount paid last year for flats with less than 60 years of lease left. "It is a rare terraced unit in an area with a lot of character, and it does not feel like it is very old at all. We think it is a fair price," said Ms Wong. Out of around a million Housing Board flats in Singapore, only 4 per cent have been selected for the Selective En bloc Redevelopment Scheme (Sers) since it began in 1995. This translates into 40,000 units. They are located on 80 sites. Of these, 73 have been completed - meaning that all residents have moved out, according to data from the HDB. These are typically sites where the land has not been well utilised and has good redevelopment potential, National Development Minister Lawrence Wong said last Friday. There must also be suitable replacement sites available for residents. The Government's financial resources will be considered as well. Under the scheme, the HDB will acquire and demolish old flats. Affected residents are compensated based on market rates. They are also guaranteed a replacement flat in new blocks, with a fresh 99-year lease. Depending on their eligibility, residents also get a fixed sum in the form of a Sers grant - $15,000 for singles and $30,000 for families. Sers residents will be given priority if they are to opt for a new flat in a Build-to-Order or Sale of Balance Flats exercise. Last Friday, National Development Minister Lawrence Wong, alarmed by a news report on old HDB flats that fetched high prices, sounded a cautionary note about such buying behaviour. Some appeared to have bought those units on the assumption that their flats will benefit from the Selective En bloc Redevelopment Scheme (Sers), he said in a blog post. This is not so, he said. Only a small minority qualify for Sers, which compensates home owners for their flats and gives them new ones with fresh leases. The rest of the flats will return to the state when their leases expire. In particular, he advised younger couples to buy a home "that covers you and your spouse to age 95". Mr Wong's comments have attracted a mix of bewilderment and concern, especially among those who live in old units. "It wasn't cheap, but I thought the value will keep going up," said IT engineer Andy Zhang, 40, who also paid top dollar for an older home. Last January, he paid $950,000 for his five-room Bukit Timah flat. It is 43 years old and has just 56 years of lease remaining. This was last year's record for an HDB unit with less than 60 years left on the lease. To pay for it, Mr Zhang sold a newer three-room flat in Clementi. Still, he said, he has no regrets. "The age of this flat was not an immediate consideration. I bought this place because my daughter's school is nearby and the location is good." Flats of a certain vintage are more popular on the resale market due to factors such as location - they tend to be in mature estates - size and amenities in the neighbourhood. Statistics show they account for a disproportionate share of transactions in the HDB resale market. Almost half of all resales last year were of flats older than 30 years. This is even though such flats make up only around one-third of the HDB housing stock. Even flats older than 40 sell well, despite loan restrictions on how much buyers can withdraw from their Central Provident Fund to finance such purchases. They form 11 per cent of transactions from 2014 to last year, even though just 7 per cent of all HDB flats are of that age. Mr Zhang, for instance, said his resale flat - at 1,346 sq ft - is larger than today's five-room units, an important feature for his family of four. Ms Siah, a property analyst, is confident she can find a buyer within the next five years or so, due to the rarity of HDB terraced units. There are only 285 left in Singapore. But generally, she acknowledged, buyers will be more cautious about older flats following Mr Wong's warning. Said the chief executive of property portal Digital Real Estate Assistant: "Location is still the prime factor, not age. But his comments mean that people may be a lot more concerned about the age component now." ERA Realty key executive officer Eugene Lim said: "It is going to be a lot more difficult to find buyers for older resale HDB flats. Prices for these flats may even take a big hit due to lack of demand. From now on, it is quite likely home buyers will view older 99-year flats differently." Still, the problem looms far in the future for Mr Zhang, now more concerned about the living conditions for his family. Asked what his plans are if his home cannot keep its value or if he is unable to find a buyer, he laughed. "That is something to worry about in 40 to 50 years' time. Who knows if I will still be around."